Ethnobotanical Leaflets 14: 599-609, 2010. Ficus carica Linn. (Syn: Ficus sycomorous; family: Moraceae) is grows in tropical and subtropical regions of India, used for varity of purpose in traditional medicine. The usefulness of this plant is scientifically evidenced, and different biologically active phytoconstituents were isolated form plant. But no reports are available on morphoanatomy, and phytochemical studies, hence present attempt was undertaken to investigate the microscopical and� preliminary phytochemical studies. The study revels the midrib is biconvex and lamina is dorsiventral, shows presence of nonglandular trichome, anomocytic stomata, prismatic calcium oxalate crystals. It shows presence of steroids, triterpenoids, cumarines, flavanoids and glycoside. �Key words: Ficus carica, Morphoanatomy, Phytochemical studies. Ficus carica Linn. (Syn: Ficus sycomorous; family: Moraceae), which is commonly referred as "Fig", grows in tropical and subtropical regions of India (Anonymous, 2002). In traditional medicine the roots are used in treatment of leucoderma and ringworms and its fruits which are sweet, have antipyretic, purgative, aphrodisiac properties and have shown to be useful in inflammations and paralysis (Kirtikar, 1996; Nadkarni and Nadkarni 1995). F. carica has been reported to have numerous bioactive compounds such as arabinose, -amyrins, - carotines, glycosides, -setosterols and xanthotoxol (Gilani et al., 2008; Vaya and Mahmood, 2006,� Ross and Kasum, 2002.). Earlier chemical examination of this plant have� shown the presence of psoralen, bergapten, umbelliferone (Seong-Kuk et al., 1995; Louis et al., 2000),� campesterol, stigmasterol, fucosterol, fatty acids (Jeong and Lachance, 2001. ), 6-(2- methoxy-Z-vinyl)-7-methyl-pyranocoumarin and 9,19-cycloarlane triterpenoid as an anticancer (Weiping� et al;� 1997, Weiping et al; 1997.) and antiproliferative agent: 6-O-acyl--Dglucosyl --sitosterol (Shai et al; 2001), calotropenyl acetate, and lupeol acetate (Saeed and Sabir, 2002). This study was aimed at providing the pharmacognostical standards� of F. carica (figs) which will be helpful for distinguish it from other species of Ficus. The plant material was collected from Botanical garden of R. C. Patel Institute of Pharmaceutical and research, Shirpur, Dhule, India. in Oct 2009.� The plant was authenticated (RCP-10) and speciman herbarium were preserved at institute herbarium library. The� leaves part were separeted form other parts,� washed, cleaned and dried for further use. The external leaf morphology was observed and studied. Fresh mature leaves transverse and longitudinal freehand sections were taken. Whereas dried leaf powder material was used for the determination of ash values, extractive values, and phytochemical constituents. All the reagents used were of analytical grade obtained from Sigma Chemical Co, St. Louis, USA or Fine Chemicals Ltd., Mumbai, India. 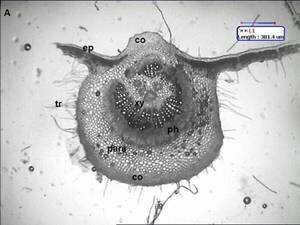 The results were registered by botanical illustration and photos taken by means of the Motic digital microscope (Motic instrument Inc, Canada) fitted with 1/3� CCD camera imaging accessory with motic image 2000 image analysis software. Ficus carica��� (Fig. 1) has simple leaves,� broadly shape, acute apex and subcordate base, more or less irrgular deeply cut into 3 � 5 palmate, coarsely irregular� margin, measuring 6�18 cm long and 5�15 cm wide, petiolate. The lamina texture is rough� and the venation is multiconvergent reticulate. In transection (Fig. 2A), the blade epidermis is single-layered (Fig. 2A) and coated with a thin and smooth cuticle.� The epidermis shows presence of anomocytic stomata (Fig. 2B), Non-glandular trichomes occur predominantly on leaf epidermal cell surface. The mesophyll is dorsiventral, consisting of about two layers of palisade parenchyma and four strata of spongy parenchyma, prismatic crystals of calcium oxalate are seen The midrib (Fig. 3A and B), in transverse section, is biconvex. The epidermis is uniseriate and has non-glandular trichomes similar to the blade. They are seldom unicellular and uniserrate. The trichome apex is acute and pointed (Fig. 3B). Adjacent to the epidermis, angular collenchyma occur, comprising approximately eight to ten rows on the dorsal side and twelve to fourteen on the ventral one. Embedded in the ground parenchyma, one to two collateral vascular bundles arranged nearly as a closed arc are present. The calcium oxalate prisms are found in spongy� parenchymatous tissue. Fig 1. Vegetative apical branches of Ficus carica Linn. Fig 2. 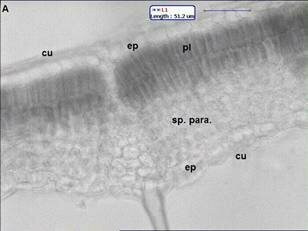 (A) Transverse section shows leaf is dorsiventral cu: cuticle, ep: epidermis, pl: palisade, sp. 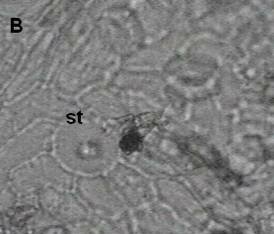 Para: spongy parenchyma� (B) st: anomocytic stomata. Fig 3. midrib structure of Ficus carica Linn. (A) Transection of the midrib, showing collateral vascular bundles arranged as closed arc; (B) trichomes in the midrib; co: collenchyma; ep: epidermis; para: ground parenchyma; ph: phloem;� tr: trichome, ph: phloem ; xy: xylem. a) Unicellular, uniserrate covering trichomes are abundant, pointed toward the apex and broader at base, thin measure 240 - 415 microns in length. (fig 2, i). b) Fragments of paranchyamatous� tissue containing spiral vascular strands measures 25 � 48 micron in diameter. (fig 3, ii). 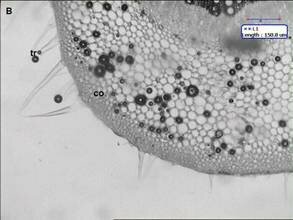 c) Numerous anomocytic stomata meaning thereby that the cells surrounding the stomatal pores are irregularly arranged. (fig 3, iii). d) The prismatic calcium oxalate of 7 � 10 microns� in diameter are less abundant and observed as free or in fragments of parenchymatous cells. (fig 2, iv). Fig 4. Powder analysis (i) unicellular uniserratenon-glandualr trichomes (ii) spiral lignified xylem vessel (iii) anomocytic stomata (iv) prismatic calcium oxalate crystals. The different histo-chemical color reactions were performed on the leaf� transverse sections to differentiate the different cell compositions and identification �(Trease and Evans, 1986) and results were given in Table 1. Table 1. Histochemical color reactions of Ficus carica leaf powder. +++ High, ++ Moderate, + Slight, - Negative. Behavior of leaf powder with different chemical reagents was studied to detect the presence of� phytoconstituents with color changes under daylight by reported method (Pratt and Chase, 1949) and the results were shown in Table 2. Table 2. Behavior of Ficus carica leaf powder with different chemical reagents. Total ash, acid-insoluble ash, water-soluble ash, and sulphated ash values of the fruit powder were done as per the reported methods (Anonymous, 1985) and the results are tabulated in Table 3. Table 3. Ash values of Ficus carica leaf. Extracts were prepared with various solvents by reported method (Kokashi et al;1958). Percentages of the extractive values were calculated with reference to air-dried drug (Table 5). Color and consistency of extracts (Pratt and Chase, 1949) are given in Table 4. Table 4. Extractive value of of Ficus carica leaf. All the leaf� extracts are examined in daylight, short and long UV to detect the fluorescent compounds by the reported method (Kokashi et al; 1958). The observations are given in Table 5. Table 5: Fluorescence analysis of� Ficus carica leaf. Freshly prepared leaf extracts were tested for the presence of phytoconstituents using reported methods (Farnsworth, 1966) and the results are given in Table 6. Table 6. Qualitative phytochemical analysis of of Ficus carica leaf extract. � Anonymous,� Indian Pharmacopoeia, 1985. 3(II),�� Government of India, Ministry of Health, Controller of Publications, New Delhi, India. � Anonymous. The wealth of India: Raw Materials. 2002, (4), India: CSIR publication, New Delhi, India. � Asadi, F., Pourkabir, M., Maclaren, R. and Shahriari, A. 2006. Alterations to lipid parameters in response to fig tree (Ficus carica) leaf extract in chicken liver slices. Turk, J. Vet. Anim. Sci. 30: 315-318. � Canal, J.R., Torres M.D., Romero A.and Perez, C. 2002. A chloroform extract obtained from a decoction of Ficus carica leaves, improve the chlosterolaemia of rats with streptozocin-induced diabetes. Acta Physiol, Hung. 87: 71-76. � De-Amorin, A.H.,� Borba, H.R., Carauta, L.D., and� Kaplan, M.A., 1999. Anthelmintic activity of the latex of Ficus carica. J. Ethnopharmacol. 64: 255- 258. � Farnsworth, N. R., 1996. Biological and phytochemical screening of plants. J. Pharm. Sci. 55:� 225-276. � Gilani, A.H., Mehmood, M.H., Janbaz, K.H., Khan, A.U.,and Saeed, S.A. 2008. Ethnopharmacological studies on antispasmodic and antiplatelet activities of Ficus carica. J. Ethnopharmacol, 119:1-5. � Hemmatzadeh, F.,� Fatemi,A., and Amini, F. 2003. Therapeutic effect of fig tree latex on bovine papilomatosis. J. Vet. Med. B Infect. Dis. Vet. Public Health 50: 473-76. � Jeong, W.S.,and Lachance, P.A., 2001. Phytosterols and fatty acids in fig (Ficus carica, var. Mission) fruit and tree components. J.Food Sci�� 66: 278-281. � Kirtikar, K.R.,and Basu, B.D. 1996. Indian medicinal plants. International Book Distributors, India 2(3). � Louis, P., Patrick, P., Andre, M., Jean-Marie, B., Andre, F.,and Jean-Paul, R.,2000. Bergapten content in fig leaves. Annales des Falsifications de l'Expertise Chimiqui et Toxicologique� 93: 427-435. � Nadkarni, K.M., Nadkarni, A. K., 1995. (1), Indian material medica, Popular Prakashan, India. � Perez, C.,� Canal,J.R., Romero, A., and� Torres,M.D., 1999b. Experimental hypertriglyceridemia and hypercholesterolaemia in rats. Acta Physiol. � Pratt, R. T.,and Chase, E. R., 1949. Fluorescence powder vegetable drugs in particular to development system of identification. J. Am. Pharm. Assoc. 38: 324-331. � Ross, J.A., Kasum, C.M., 2002. Dietary flavonoids,bioavailability, metabolic effects, and safety. Annu Rev Nutr. 22: 19-34. � Rubnov, S.Y.,� Kashman, R.,� Rabinowitz,M., Schlesinger,M., and� Mcchoulam,R. 2000. Suppressor of cancer cell� proliferation from fig (Ficus carica) resin isolation and structure elucidation. J. Nut. Prod. 64: 993-996. � Saeed, M.A., and Sabir,A.W., 2002. Irritant potential of triterpenoids from Ficus carica leaves. Fitoterapia, 73: 417-420. � Seong-Kuk, k., Dong-Ok, C.,and� Hee-Jong, C., 1995. Purification and identification of antimicrobial substances in phenolic fraction of fig leaves. Han'guk Nonghwa Hakhoechi.38: 293-296. � Serraclara, A.F.,� Hawkins, C., Perez, C.,� Dominguez, E., Campillo,J.E.,and Torres, M.D. 1998. Hypoglycemic action of an oral fig-leaf decoction in type-1 diabetic patients Diabet. Res. Clin. Prac.39:19-22. � Shai,R., Yoel, K., Ruth, R., Michael, S.,and Raphael, M., Suppressors of cancer cell proliferation from fig (Ficus carica) resin: Isolation and structure elucidation. J.Nat Prod 2001. 64: 993-996. � Vaya,J., and Mahmood, S., 2006. Flavonoid content in leaf extracts of the fig (Ficus carica L.), carob (Ceratonia siliqua L.) and pistachio (Pistacia lentiscus L.). Biofactors; 28:169-75. � Weiping,Y., Hongming, C., Tianxin, W., and Mengshen, C., 1997a. A new coumarin compound with anticancer� activity. Zhongcaoyao. 28: 3-4. � Weiping, Y., Hongming, C., Tianxin, W., and Mengshen, C., 1997b. Research on the chemical structure and anticancer activity of 9, 19-Cyclopropane-24, 25 ethyleneoxide-5-en-3�-spirostol. Zhongguo Yaowu Huaxue Zazhi. 7: 46-47.